If you enjoy leisure time in your backyard, you're not alone. More people are spending time outdoors: gardening, grilling, enjoying the pool, and more. Keeping track of the time is a contemporary necessity, even when we are enjoying our time outdoors. Why not keep the time close at hand with a beautiful and functional weather resistant outdoor clock? 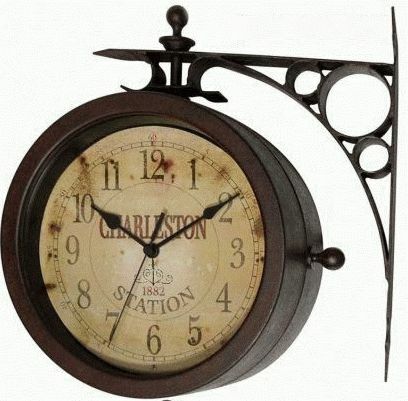 The Charleston Indoor / Outdoor Clock brings a vintage charm to any patio, porch, or pool side. The case is made from a durable metal, and the lens from glass. A decorative bracket (which is included) holds the clock housing away from your house. The clock may be rotated on the bracket to allow for ideal viewing from any point in your yard. The dial features a vintage "Charleston" design and looks like it could have been plucked from an old train depot.